We’d love your help. Let us know what’s wrong with this preview of Reckless! by Byron L. Dorgan. 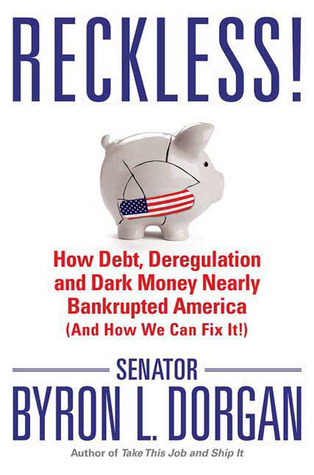 As one of only eight senators to vote against bank deregulation, Byron Dorgan warned America that a free-market system left unchecked is like a driving a car at ninety miles per hour without brakes. With the recent financial collapse having proven him right, Dorgan exposes this modern-day carnival of greed and calls out the corporate executives who reap millions and even b As one of only eight senators to vote against bank deregulation, Byron Dorgan warned America that a free-market system left unchecked is like a driving a car at ninety miles per hour without brakes. With the recent financial collapse having proven him right, Dorgan exposes this modern-day carnival of greed and calls out the corporate executives who reap millions and even billions as a “reward” for self-interest and mismanagement. More poignantly, he argues that public officials we elect to represent the best interests of the people have sold us out, as government has become a partner to Big Oil, Big Media, and Big Pharma. To ask other readers questions about Reckless!, please sign up. Be the first to ask a question about Reckless! Senator Dorgan offers us a limited survey course on public policy, looking at war profiteering, the financial crisis, the need for health coverage reform, wildly irresponsible fiscal policies, the wall-street debacle, increasing concentration of wealth at the top, energy, immigration, tax policy. As a survey it is certainly a useful volume. But only if the reader has just returned from a trip to, say, Mars. There is very little that is new or news here, and getting even to what is book-worthy re Senator Dorgan offers us a limited survey course on public policy, looking at war profiteering, the financial crisis, the need for health coverage reform, wildly irresponsible fiscal policies, the wall-street debacle, increasing concentration of wealth at the top, energy, immigration, tax policy. As a survey it is certainly a useful volume. But only if the reader has just returned from a trip to, say, Mars. There is very little that is new or news here, and getting even to what is book-worthy requires slogging through large dollops of stale, stump-speech humor (and even when he produces something relatively funny, he feel a need to throw in a “just kidding,” lest someone who voted for Herbert Hoover take offense) and bucket-loads of not-my-fault. It’s not folksy, it’s annoying. I am not sure who Dorgan’s projected audience is. Wonkish types know the policy issues as well as he does and the general public is unlikely to pick up a policy book by a Senator. It is not likely to be an election ad. The guy is not running for higher office, as far as I know. Make no mistake, I like Dorgan. I think he is a decent guy with a better-than-average take on a wide range of political issues. I might even vote for him were he running in my state, but the book left me dry. One positive is that he offers a list of ways one might address the issues he identifies. Of course his solutions are not always comprehensive enough for my taste. He focuses in particular on the financial crisis, with particular emphasis on the greed of insiders and the unwillingness of Washington to do their regulatory due diligence, war and profiteering, energy policy and health care. If you read policy books and real newspapers, there is little here that will be news to you, a detail here and there, maybe. Re fuel, he seems to be in love with the expansion of diesel, of the bio and petro varieties, but indicates no knowledge of the greater harm to the environment caused by diesel fuel over alternatives. More efficient? Perhaps. More polluting? Definitely. Also he is far too eager to embrace expanded drilling in some sensitive areas. He presents his solutions as common sense, and often that is true. But one cannot help but wonder how much common sense it makes to subsidize growing crops for ethanol when there is a strong possibility that it takes more energy to produce ethanol than the resulting ethanol actually generates. One must wonder if local political calculations play a role in that notion. How about removing tax incentives for oil companies that are awash in tens of billions in annual profit and using that money for development of renewable alternatives? Re health, he devotes considerable space to decrying the eating habits of the American populace. Yet I found no evidence that he has a problem with the massive subsidies in place to encourage growing corn. Current subsidy programs ensure that food is plentiful, cheap and of increasingly lower quality. It costs much more to eat a healthful diet than it does to scarf down subsidized fructose products. Yet again, the lower-income citizens are being blamed for behaving in an economically sane manner. A comprehensive health care plan would include elimination, or at least significant reduction in subsidies for growing corn. If we want Americans to eat a more healthful diet, subsidizing the planting of fruits and vegetables makes a lot more sense. He decries the availability of sweetened drinks in public schools but offers only passing reference to the fact that public schools are so stressed for cash that they need to constantly be on the lookout for potential new sources of revenue. Just look at California where the voters, via the much-gamed initiative system, vote to mandate the provision of this or that service, yet always vote down propositions that would actually pay for them. Their public school system has declined from one of the best funded to one of the worst as a result. I was most impressed by his reporting on corruption issues, war profiteering by the usual suspects among American corporations, and by some of the specifics regarding corruption by government officials in Iraq. He quotes an All Things Considered report: “A secret order from the Iraq prime minister’s office bans the Commission on Public Integrity (CPI) from investigation top Iraqi officials unless they have the consent of Prime Minister Nouri-al-Maliki.” Dorgan tells a tale of an Iraqi whistle-blower who was repeatedly back-stabbed by American officials, Condi Rice in particular. Some of that was news to me. It is my impression that Dorgan is basically a decent guy, with his heart in the right place. I am glad that he has been on the right side on a wide range of policy issues. But the Bush war-mongers are still on the street. The wall-street thieves (with very few exceptions) are still gaming the system for their personal gain. 249 pages of campaign literature is worth a lot less than blanketing the airwaves with demands for prosecution of those who illegally authorized torture, those who lied us into war, those who attempted to drown our government in bathtub by looting the public treasury, those who are too big to fail but not too big to steal. I want our leadership to get serious about holding accountable the criminals who have been running our country. There is nothing wrong with putting out a book on policy issues, but I want some actual action to follow. Make some noise senator. This was not just a rant about how the financial crisis happened but a book offering real solutions so that this type of event can be avoided. That is what i liked most, anybody can write a book that complains about what got us there it is another who can offer up solutions to assure that the same mistakes can be avoided. Senator Dorgan of North Dakota writes about tax cuts for wealthy Americans; Cayman Islands tax avoidance; health insurance; health care concerns. He gives suggestions for improving the political scene. My old boss can be very persuasive in finding fault with Wall Street.